A nail tutorial and review (it’s so easy it doesn’t really need to be called a tutorial) using my favourite red nail polish from OPI. Genuinely feel like I’m insulting your intelligence by even explaining this, but I did two coats of cupid loves comet and then I topped it with a coat of the Blizzard polish from Models Own. 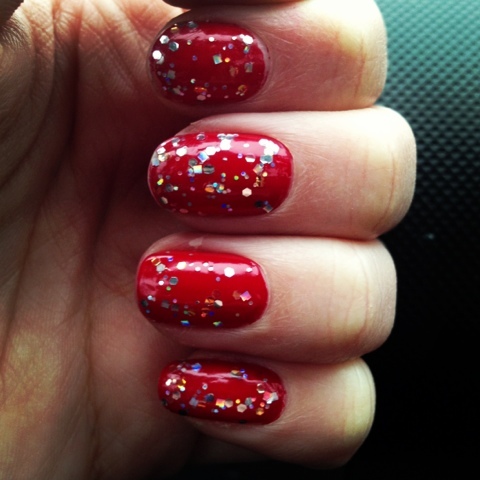 I love the effect of this, it’s pretty all year round but especially nice for the Christmas period however I’m definitely not impressed with the glitter polish. The glitter is incredibly gloopy which makes it very hard to work with, especially after you’ve already applied two coats of standard polish. It puts an awful lot of product on to the nails which in turn makes drying more difficult and lessens the wear time significantly. What do you think? Anyone know of any other brands which make a nice glittery polish? This combo is sooo cute, love the colour. I actually bought a brilliant gold glitter polish from AVON just before christmas! Only a small bottle but for £1.50 I really liked it, Much prefered to any Models Own, which I must admit I'm not a fan of … Nails inc all the way!